We're offering 15% off everything in our store; get your Christmas orders in by December 6th, please! We're having a store-wide sale; take 20% off everything in our shop for a limited time. Visit www.fborfwshop.com for signed books, autographed prints, plush toys, holiday cards and more. We're having a store-wide 25%-off sale for one week! We're having a store-wide sale. Take 20% off of everything until November 1st! 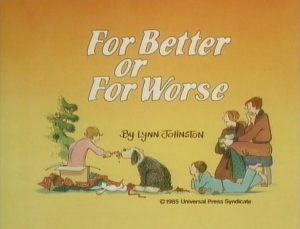 Lynn's well-loved animated specials are now available as digital downloads! We've also got The Bestest Present as a download, and in DVD format. For Better Or For Worse Christmas Fun -- and 20% off sale! It's December 1st -- time to bust out the decorations! Or, in our case, the games, colouring sheets, and new stuff for our shops. Read all of Lynn's popular Christmas strips here in our archive. 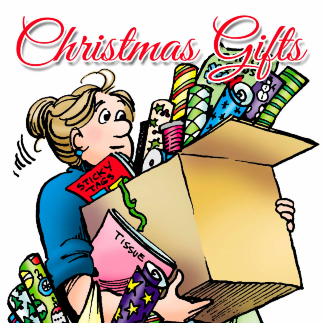 We've just created a brand-new line of Christmas items in our Zazzle shop. Some of these designs are Lynn's personal holiday cards from years past, now available to everyone else! 20% Off Storewide in This Shop! Have you been waiting to snag that special Christmas gift? We're now offering 20% off everything, from now until December 15th at FBorFWshop.com -- we have signed prints, collection books, DVDs of our beloved holiday specials, and more. Émissions spéciales animées, maintenant disponibles. Four of the animated specials Lynn created with Lacewood Productions are now available in French, as digital downloads in our store. Each special is approximately 23 minutes in length. They're in MP4 format and will play on Mac OS, Windows OS and Android devices using your preferred media player. Autographed Prints Now Available - 50% off! Signed prints of Lynn's strips are now back in our store, and we're offering them at 50% off for a limited time. Choose one of our popular strips, or tell us which one is your favourite and we'll custom print it, just for you!